The key thing that differentiates this model from others is its upgradeable nature. The basic T-4555 is an FM/AM tuner, but a couple of screws on the rear panel can be undone, enabling the RF module and ancillary components to be removed and replaced by a module that handles DAB as well. It's a nice idea, although as far as we can see from a quick Internet search, plenty of dealers are offering the analogue/digital version as standard, and that's how we received our review sample. The DAB module employed is from Frontier Silicon, while the FM one is unlabelled but looks much like all of them - about the size of a pack of cards. There's the usual audio board carrying output circuits and power-supply components, while power comes from a low-profile frame transformer of quite generous size. While rival tuners are much of a muchness in terms of features offered, this one is distinctly individual. 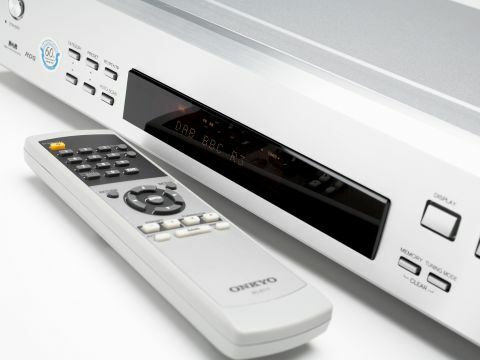 For instance, it has a fantastic array of remote-control connections, making it a strong choice, one would think, for integrated multiroom installations. On the other hand it has no digital output. And one feature may catch a lot of audiophiles out: the Dynamic Range Control setting on DAB defaults to 1, which means maximum dynamic compression is applied by default. To switch this off you need the remote, and many people may never do it. We've argued in the past that this should have been the default setting from the outset, to encourage broadcasters to use DRC intelligently (thus maximising dynamic range for listeners who can be bothered to switch it off), but since that hasn't happened we have doubts about Onkyo's decision. Well, you read it here - be aware! Once again, DAB sound quality seems to be very much on a par with other models' efforts, save for one slightly surprising aspect - the sound is very much lower in level than in most cases. That's presumably to compensate for the DRC, but with most stations, which don't implement DRC anyway, it may make the tuner sound very unimpressive in a comparative demo. Don't be put off, as it's perfectly competent. It's also highly competent on FM. Justifying its price premium over many rivals, the T-4555 provides a remarkable amount of detail with a wide selection of radio stations, offering a cleaner and less veiled version of events than the competition by a noticeable margin. The sound has good body to it and tonality is gratifyingly neutral apart from a very mild trace of upper-bass boom, while noise isn't intrusive. The key point here is that the sound is much less like a radio broadcast and more like a recording being played on a good source component. FM is by no means perfect and tends to add a degree of grain and congestion to the sound, but this is something only the best tuners can (largely) avoid, and this model is frankly one of the best we've heard recently at such a sensible price. The result is real hi-fi insight and resolution, together with precise and stable imaging and a fair degree of depth. Classical music is refined and appealingly multilayered, rock is energetic and lively, and jazz is tight and bouncy. There's room for improvement, and tuners costing £1,000 could still show this a few tricks in the detail department, but in the company of its peers this is a highly recommendable purchase.